A comfortable environment inside your Mercedes is as important as the engine performance. 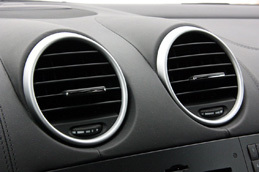 A regular check up of the five major components of the cooling system—compressor, refrigerant, condenser, expansion valve, and drier/evaporator—are essential to ensuring your ride is a comfortable one. If any elements of the system are not working optimally, we will repair or replace them. LEGAL DISCLAIMER BMW of North America, LLC ® or Mercedes® trademarks and/or logos featured or referred to within the dobsonsgermanauto.com Website are the property of their respective trademark holders BMW of North America or Mercedes-Benz USA, LLC are not affiliated with Dobson's German Auto Service, our service center or our website in any way. BMW of North America, LLC ® or Mercedes-Benz USA, LLC do not sponsor or endorse Dobson's German Auto Service in any way, shape or form. Nothing on this Website, specifically, nor the business operations of Dobson's German Auto Service in general, is intended to suggest or imply a connection, affiliation, sponsorship or endorsement by or with Mercedes-Benz USA, LLC or BMW of North America, LLC. Any and all photographs or marks utilized on, in, under, around or in the vicinity of this website are intended to communicate the types of services that Dobson's German Auto Service provides and are not intended to suggest or imply a connection, affiliation, sponsorship or endorsement by or with Mercedes-Benz USA, LLC or BMW of North America, LLC .